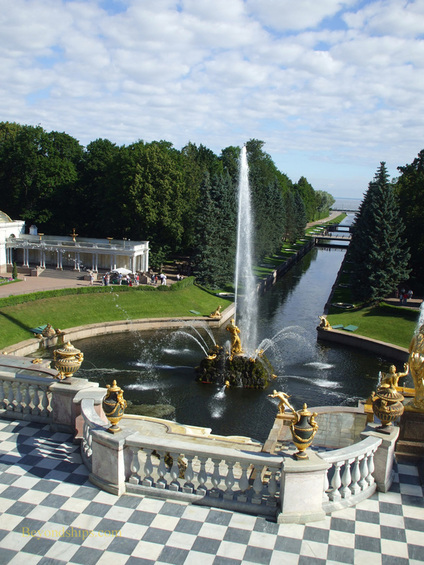 Above: The Sampson Fountain and the canal to the sea. Above: The Great Cascade. Underneath the Great Cascade is a man-made grotto. 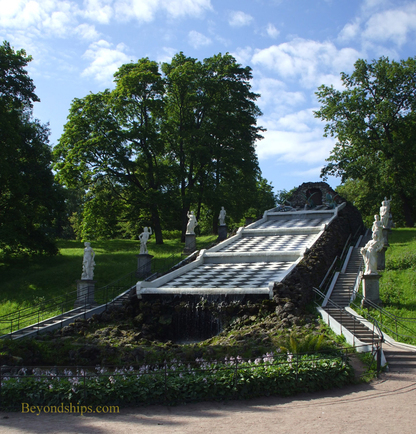 Above: Another fountain in the Lower park - -The Chessboard Cascade. 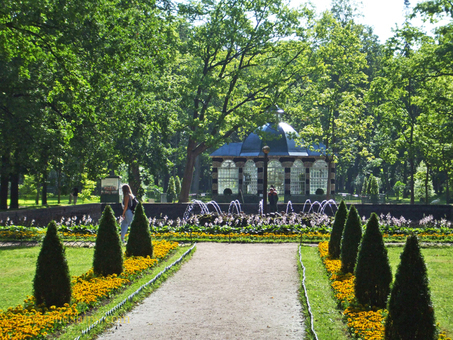 Below: The garden in front of the Monplaisir Palace. After touring the Grand Palace, we went out to the terrace that runs along the length of the northern facade of the Grand Palace. Inasmuch as the ridge that the Palace is on is 16 meters higher than the Lower Park there is a stunning view of the pleasure grounds below the Palace. While the Upper Park is nice, the Lower Park is spectacular. 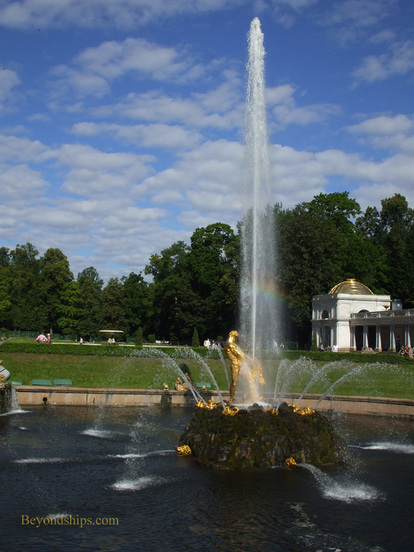 When people speak of Peterhof, they inevitably talk about the fountains. 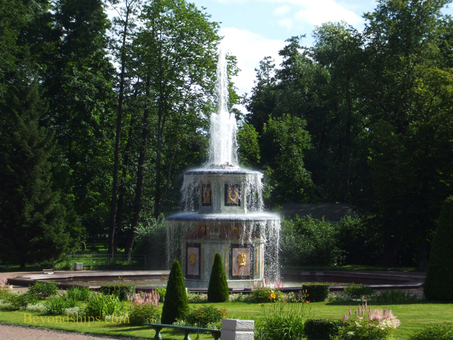 There are more than 100 fountains in the Lower Park. Those in the Lower Park are fed by the ponds in the upper garden. Since the Upper Park is higher in elevation than the Lower Park, the fountains in the Lower Park are able to spray their plumes of water without use the pumps. There is one exception - - the jet for the Sampson Fountain comes from an aqueduct that brings water from miles away. The Sampson Fountain is the centerpiece of an array of 64 fountains that includes 250 statues and reliefs. Water flows down the marble stairs of The Great Cascade past cavorting gilded pagan gods and nymphs to a large pool. In the pool is a statue of Sampson ripping open the jaws of a lion, releasing a jet of water that shoots 21 meters into the sky. Beyond that is a canal leading to the sea. It was originally a marine approach to the Palace but became purely decorative after the installation of the Sampson fountain. As you walk the grounds of the Lower Park, you encounter a variety of other fountains. Most are just for ascetics but some reveal Peter's sense of humor. Step on the wrong paving stone and the fountain will spray you. The gardens themselves are predominately French-style formal gardens. 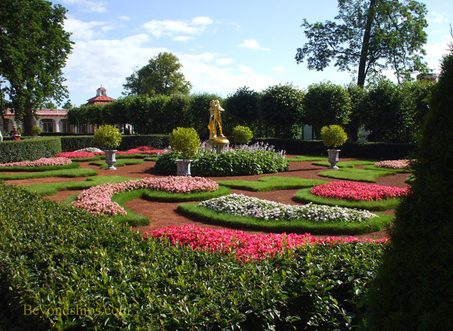 However, Catherine the Great also added a section inspired by the English landscape gardens. In the grounds, there are also a number of smaller buildings. These include not just such country house staples as an orangery but also smaller palaces. Peter built several of these including Monplaisir Palace, Marly Palace and the Hermitage Pavilion as entertainment palaces where he could get away from court life. 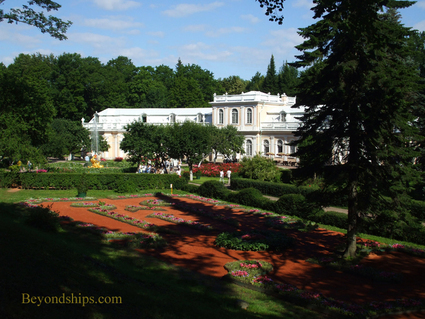 Subsequent czars and czarinas built additional palaces and buildings. 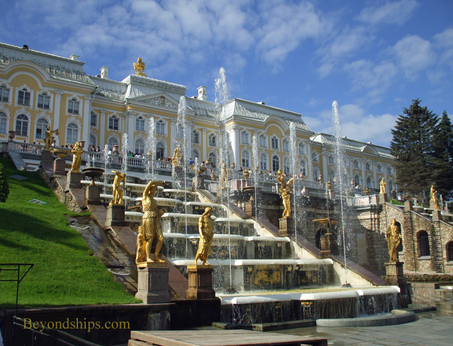 There is more to Peterhof than can be seen in one visit. However, you can see enough to make it a worthwhile endeavor. The house and grounds have been lovingly restored. As Peter had hoped, the entire complex is impressive from its ornate palatial rooms to its superb park. Above left: The garden by the Orangery. Left: Peter was also impressed by the menagerie he had seen at Versailles and so he constructed two Aviaries at Peterhof. Above: One of two Roman fountains in the Lower Park.